The history of Gary is an important part of the history of South Dakota. 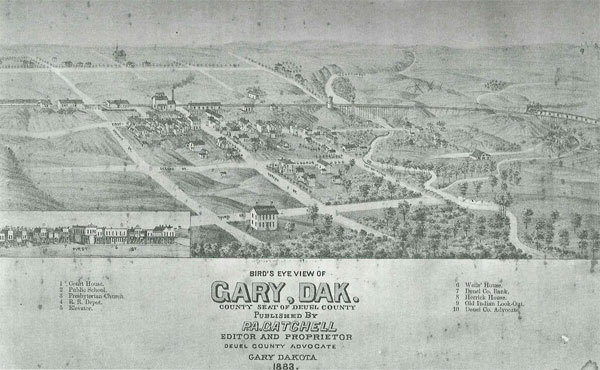 Gary, situated near the Minnesota border, was one of the first settlements in Dakota Territory. The railroad, which later helped build many other towns along its tracts, first entered Dakota Territory at Gary, in 1872. The formation of the Gary Historical Association was the result of interested people taking pride in the Gary community; wanting to preserve its history and establishing a place to exhibit local artifacts. Local historians, collectors, and descendants of pioneer families encouraged organizing a historical association and made plans for a centennial celebration in 1972. The Gary Historical Association, Inc. was organized on February 12, 1967. Officers elected were: Mr. Arnold Baer, president; Mr. Eldon Stone, vice-president; Mr. Perry Heaton, Jr., secretary-treasurer and Mr. William Stone, historian. The five members of the board of directors were: Dr. Maynard Cochrane, Dr. Inez Hinsvark, Mr. Jack Schaeffer, Mr. Orrin Rhyne and Mr. Aloysius Miller. A temporary museum was set up on the ground floor of the Odd Fellow’s building. Mrs. Gladys Lohr and Mrs. Pearl Peden were appointed museum curators. The book, “B.J. Cochrane", by Evadna Cochrane Burba, published by the South Dakota State Historical Society, was to be offered for sale by the curators. Buttons were ordered to begin fund raising and were sold by the Town and Country 4-H Club and the Gary Historical Association. Dr. Inez Hinsvark and the Hinsvark families donated Out lot 3 in memory of their parents, Adolph and Clara Hinsvark, to the Gary Historical Association to be used as a historical park. A memorial marker was placed at the Gary Historical Park in honor of the Hinsvark’s contribution. A twenty five year lease from the City of Gary on the adjoining out lot 12 helped finish the park area. The lease was renewed with the City of Gary again in 2006 for as long as the Gary Historical Association is organized. In March of 1968 the Gary Historical Association purchased the former Sports Inn building located on the east side of Coteau Street, one half block north of First Avenue. This building was one of the original buildings in Gary. It had been located on the west side of Coteau Street until 1911 when it was moved and a brick building was put up in its place. Artifacts were moved from the Odd Fellow’s building to the new museum location. It was decided in 1984 to pursue the idea of building a new museum due to the cost of repairs on the old building. In 1985 a new museum was built at the museum park on Third Street. The building was a 30’ X 52’ pole shed with a ten foot swinging door, skylights, a walk-in door and eight foot sidewalls. The building which was built by Don Grabow cost approximately $7,500. Once the building was completed, there were many decisions and tasks for the members such as landscaping, electricity, moving and organizing the artifacts. The moving day was August 25, 1986. An awning over the front door, shelving and installation of flag pole were projects completed by many volunteers. In 1989, a ventilator fan was purchased for the north end of the building to help control humidity. In 2001, a new shingle roof was installed on the museum and a cement pad poured in front of the walk-in door under the awning. A much needed air conditioner was installed to help control humidity in the summer months. Several display cases have been purchased and new glass tops added to several of the older display cases. New donated artifacts are added every year. Electricity was put underground from the school house to the museum in 2007. Following the dedication ceremony, a public open house was held at the Cochrane homestead located on Lake Cochrane. A history book of Gary was sponsored by the association in conjunction with Gary’s Centennial celebration. It was complied through the efforts of the Gary Interstate “R.R. Miottel, editor and publisher”, Mr. William Stone, historian and various organizations submitting history of their groups. The book was entitled “Gate City to the Dakotas” and sold for $5.00. A second printing of the book was completed in 1974. The book covered history of Gary from 1872 until about 1920. Other Centennial souvenirs included a plate with a picture of Gary as it was in 1900 (price $2.25), a coin with a $.50 value until September 1, 1972 and a button. By September of 1972, progress was made on the future planning of Gary in playing a role in the United States Bicentennial Year of 1976. The Association submitted application for several grants to the South Dakota Bicentennial Commission. These applications were submitted under the direction of Mrs. Irene Heaton and Mrs. Eldeen Baer. A delegation from Gary attended and presented the plans for Gary during the Bicentennial in 1976. At this meeting the Commission granted Gary $1500 for restoration of park projects and was named a “Historic City”. The Bicentennial Commission presented the City of Gary and the Gary Historical Association with a Bicentennial Historic City flag on July 4, 1973. A flag pole was erected at the Historical Park to display the flag next to the memorial marker. Following the noon meal, Mr. Alex Johnson of Watertown, SD., a member of the South Dakota Bicentennial Commission, made the formal presentation of two flags, one with an American emblem, which had flown over the nation’s capitol and a South Dakota Bicentennial flag. Mayor Elmer Hinsvark accepted the flags. Gary was one of seven sites to receive these flags. The Gary Historical Association had come a long way in carrying out park and museum plans with the help of members, volunteers and youth groups, but the greatest boost came in 1974 with the expansion of the Green Thumb program to Deuel County. The program provided the Gary Historical Association six Deuel county residents to complete renovation of buildings and project completion work. Three buildings in Gary were nominated and accepted to the National Register of Historic places in 1975 after a lengthy application was submitted by Eldeen Baer and Irene Mews Heaton. The buildings were the Odd Fellows Building, the former South Dakota School for the blind and the whistle house. They were accepted for their architectural design. These buildings are all located along Coteau Street. The Gary Historical Association sponsored a monument honoring the coming of the railroad to Gary in 1872. The unveiling and dedication of the monument was held July 3, 1976 as part of the Bicentennial celebration. Several guest speakers were in hand, including Dr. Maynard Cochrane, President of the Historical Association; Mayor Elmer Hinsvark; Mr. Alan Woolworth, Chief Archaeologist of the Minnesota State Historical Society and native of Deuel County; Mr. Del Clark, traveling agent of Chicago-Northwestern Transportation Company of Canby, Minnesota and Mr. Herb Teske, Secretary of Transportation of the State of South Dakota from Watertown. The monument is located on the west side of Coteau Street near the original railroad tracks location. The monument, when first erected, contained some printing errors but was later reversed with printing corrected on the other side. It reads as follows: “THIS MONUMENT ERECTED BY THE GARY HISTORICAL ASSOCIATION IN THE BICENTENNIAL YEAR OF 1976, HONORS THE FIRST PERMANENT RAILROAD IN DAKOTA TERRITORY. WITH LAND GRANT AID AND UNDER A CHARTER OBTAINED IN 1854, RAILS WERE LAID TO GARY THE CHOSEN SECTION HEADQUARTERS IN 1872 BY THE WINONA & ST PETER RAILROAD. LATER KNOWN AS THE CHICAGO & NOTHWESTERN RAILROAD COMPANY SO PROVIDING ACCESS TO THE REGION FOR THE THOUSANDS OF HOMESTEADERS AND OTHER SETTLERS WHO ARRIVED IN THE YEARS THAT FOLLOWED.” Landscaping of rocks was removed from around the monument in 2001 and a concrete pad was poured to provide easier upkeep. Irene Mews Heaton and Eldeen Baer, assisted by Mrs. Alyce Knopp with art work and Connie Severson with printing, put together a brochure on Gary and its history. These were ready for distribution at the dedication of the railroad monument. As South Dakota’s Centennial approached in 1989, the Gary Historical Association purchased a Centennial package which consisted of stoneware mugs, cap and T-shirt. The Association voted to purchase a South Dakota Centennial flag. The Gary Historical Association joined the South Dakota State Historical Association in 1993. A big year for all the Gary’s residents was 1997. Gary was 125 years old and the Association celebrated 30 years. A historical update, 1972 – 1997 was printed by the Clear Lake Courier with the help of a $1000 grant from the Daughters of the American Revolution located in Sioux Falls, SD. Fay Stone, Patti Haas and Eldeen Baer researched, wrote and assembled the information for the publication. Randy Meyer contributed the cover design and artwork. Along with the history book, ½ pint jars of cranberry relish, using the recipe from the buffalo supper were sold at the celebration. The Gary Historical Association offered refreshments for a free will donation. The Gary Historical Association records showed 400 visitors registered during the celebration. The Gary Historical also sponsored a historic walk and guided tour of the City of Gary. Many locations were highlighted and their history recalled. The Gary Historical float in the 125th parade was a birthday cake on the flatbed of Roy and Peggy Norton’s model T ford truck. Eldeen Baer and Rose Mason, president of the Gary Senior Citizens, rode on the flatbed. The birthday cake advertised the buffalo super, the Gary Community Club, Gary Senior Citizens and congratulated Gary as a Historical City serving the community since 1872. The school house building, formerly District 61 country school, also received some improvements in 1998. Marvin Hunt laid a new floor in an area that was formerly the stairway to the basement when the school house was located north of Gary. This extra room provided space for storage. Don Schulte, with help from Vera Sween repaired and hung Gary High School senior class composite pictures. This building was built in 1927 and located one mile west and three miles north of Gary. It was obtained and moved to the Historical Park in 1967. Over the following years it was repainted, wood floors refinished and furnace installed. The building contains many original desks, books and other items. The original District # 61 school building was built in 1897. It was moved 3 miles north and ½ mile west of Gary by Hans Ness and used for a dwelling. Over the years many Gary Public school artifacts have been added to the school for display, including a collection of Gary School yearbooks, pictures and a trophy case. In 2005 the school received a new coat of paint on the outside and a new roof. Sports, band and cheerleading uniforms from the former Gary Public School were also acquired and displayed in the school. A collection of Gary School annuals was also started in 1998 with the donation of annuals having belonged to Lawrence Asher, a former teacher of Gary Public School. With the help of the Green Thumb organization in 1998, Vera Sween was hired as caretaker of the Historical Park. Many hours were spent cleaning the buildings, rearranging and painting shelves in the museum. All items were tagged and cataloged. Marvin Hunt and Ed Cornell removed the tin ceiling tile from the former A& J Café before it was torn down in1997. The tin ceiling panels were to be used in the jail/whistle building, but there was not enough of them to complete the entire ceiling. A self-guided historical walk was sponsored by the Gary Historical Association during the third of July celebration in 1998. Signs were installed by Joyce Meyer in front to the buildings of interest. The City of Gary took over mowing of the Historical Park grounds in 2000. Ottertail Power Company installed two poles in front of the school house on which the school bell was mounted. A concrete Gary School sign, made by the shop class in 1980, was hung below the bell in 2005. In 2001, Eldeen Baer and Patti Haas had discovered that the archive bound issues of the Gary Interstate were abandoned in the former South Dakota School for the Blind. Windows had been broken and doors left open in the building, subjecting the books to the elements. After contacting Ed Devorak, the owner of the former School for the Blind, the bound issues of the Gary Interstate were moved to the school house at the Historical Park. It was discovered in 2003 that about 10 years of the Gary Interstate had not been bound in book form. The issues were acquired and sent in to be bound and added to the collection. The collection of the Gary Interstates were moved from the school house in the Historical Park to the Gary Administration building for better climate control and access to the public. The beginning of 2004 saw the formation of the goal to obtain a microfilm reader and the entire collection of micro film of the Gary Interstate newspaper. Fifty microfilms were purchased with donations of $35.00 per roll by individuals and families. The microfilm reader was purchased and installed at the Gary City Library in 2005. Software was also purchased to connect the reader to a computer for printing and archiving purposes. A plaque was placed at the city library listing all of the donors whose donations helped purchase the microfilm collection which was completed in 2006. While cleaning excess articles from the basement of the Legion Hall, an old telephone booth was relocated to the museum. The telephone booth is a wooden double walled booth that was located in a house in Gary which contained the telephone switchboard for the Gary area. The phone booth allowed privacy for the public to make phone calls. A three day writer’s workshop was sponsored by the Historical Association on July 6 – 8, 2004. Archie Hill, a former Gary High School graduate, held the work shop at the Gary community room with 14 people in attendance. Another workshop was held in August of 2007 at the Gate City Lodge with six attendees. Participants always enjoy the experience of Archie Hill’s teaching skills. The first and very successful pancake feed hosted by the Historical Association was held in February 2004. They have continued to be a successful fund raiser. In August of 2006, President Roger Baer presented a twelve month plan of 19 goals to be completed by June of 2007 in time for Gary’s 135th anniversary and the Gary Historical Association’s 40th anniversary. The first goal of gathering of email addresses of members allowed us to start a monthly newspaper. The Gary Interstate was revived as a monthly newspaper in 2006. An all volunteer group of people help make this a success. Several individuals contribute articles for the paper and Connie Severson agreed to be editor. Sharlotte Baer took over as editor in the fall of 2007. Bernice Jenson contributes an article “Down Memory Lane”. Betty McCormick contributes an article “Memories from the Heart”. Roger and Sharlotte Baer organize, print and distribute approximately 350 newspapers every month in Gary, Clear Lake and Canby. The articles from the paper are also available for viewing on the web site. Approximately 120 Gary Interstates are sent out by email. Some copies are mailed out to subscribers. Through money raised during fund raisers, enough money was raised by the Gary Historical Association to lay a concrete pad under the machinery in the Historical Park. With the help of City of Gary employee Mike Nosbush and several other volunteers, a 40’ X 60’ pad was poured in November, 2006, just west of the log cabin. The jail house/whistle house building was erected south of the depot and iron cells were purchased in 1913 by the City of Gary. A belfry was added to house a fire alarm bell. A new siren was installed in the building in 1929. The cells were later moved to the new city hall known as the Golden Nugget in1945. The building was then used for storage. The building was included in land sold to George Cook in the 1970’s on which he built a lumber yard. George then donated the building to the Gary Historical Association. New windows were installed and the building was painted in the 1980s. Over the years, tin ceiling was collected from various buildings that were to be torn down to replace the existing ceilng which had rusted and fallen apart. There was never enough of one style to complete the job. In 2006 the renovation of this building was added to the goals of the Historical Association. With donations from the City of Gary, alumni and the community, enough funds were collected to replace the ceiling and renovate the interior of the building. New lights and outlets were added inside of the building. It was decided to add plywood to the walls because new paint would not adhere to the original walls. The walls were then painted white. A mural of the “Birds Eye View” of Gary, taken from an original drawing made in 1887 was painted on the south wall by Canaan Creations of Clear Lake, South Dakota. Another mural will be painted on the north wall in the near future. Samples of different tin ceilings from several buildings in Gary were mounted on the south wall. A score board from Gary High School will be mounted on one of the walls along with some Gary High School memorabilia. Repairs were made to the ceiling joists, a center support added and new ceiling tile installed. A sign was added above the outside door informing the public of the Gary Historical Association Information Center. Bars were installed on the four windows. The jail cells were moved to the center of the building and unlocked. Two life size dummies were made and added to the jail cells by Jean Hinsvark. A log cabin, donated by the Roy Rangaard family of Canby, Minnesota, was dismantled and moved to the Historical Park in 1967. This log cabin was erected in 1872 by Christian Houg, one of the first Norwegian pioneers to settle along the Lac Qui Parle River east of Canby, Minnesota. The log cabin was rebuilt in 1976. By this time only a few of the original logs were sound enough to reconstruct the log cabin. Additional logs were acquired and used to assemble a replica of the cabin. The Wecotah Extension Club helped furnish the log cabin with furniture and accessories. Two pine trees were planted in front of the log cabin in the early 1980’s. In 2007 they were removed because of their size. The log cabin received new cedar shingles and a ventilator was installed on the roof for better climate control in 1998. A country store was purchased and moved in from Burr, Minnesota, to the Historical Park on September 4, 1967. The building was set on a concrete foundation. The post office cage and table were purchased from a store in Altamont and set up in this building. A display case, benches and grocery items were added to complete the display. In 2004 repairs were made to the front, roof and siding and the building received a new coat of paint. New steps were added of all weather decking material. The first buffalo supper sponsored by the Gary Historical Association was held October 29, 1967 in the American Legion Hall. Prior to 1967, the Methodist Men’s Club had been preparing the buffalo supper for several years, but it had grown to be more of an event than they could accommodate in the church basement. At times, 1000 people were served seating 200 people at a time, serving from 4:00 – 8:00 p.m. The menu included roast buffalo, mashed potatoes, gravy, corn, cranberry relish, milk, coffee, relish plate and assorted breads. Dessert began as assorted cakes, but later changed to ice cream Dixie cups. In the first years a committee was formed to go to Sutton Brother’s ranch near Oneida, South Dakota where the buffalo was purchased. The carcass was brought back to Gary and the “cut-up” committee would cut the roast and grind the burger at Walt’s Locker. The roasts on the day of the buffalo supper were placed in ovens in various homes in Gary until ready for serving, volunteers would then collect the roasts as needed for the supper. In later years electric roasters were purchased and the meat was then all cooked at one location. Many people were needed to peel and mash potatoes, make gravy, cook corn and coffee the day of the supper. Several days ahead of time oranges, apples and lemons were cut, peeled and ground along with cranberries to make the famous cranberry relish that was served at the supper. It would take about 100 volunteers to get the buffalo ready, all the other food cooked, served and cleaned up. Dorothy Sander provided musical entertainment during the supper. After supper customers could partake in a game of free bingo for the prize of one pound of ground buffalo. They could play bingo longer for the price of 3 cards for $.25. People would go through a buffet line, then were directed to their chairs where a waitress would collect the trays and serve a beverage of either milk, water or coffee. Waitresses kept the table full of bread, butter, salt, pepper, relish trays and cake or handed out ice cream cups. As the rows of tables were emptied several younger girls would clean off the tables to be reset for the next 300 people. This system kept the lines moving most of the time without waiting in line for long periods of time. Trays would be cleaned by another group of volunteers. The band shell was donated by the City of Gary in 2007. The building received a new coat of paint, shingles, interior and exterior electricity. Several entertainment events were held in the band shell over the summer. During the 135th celebration a reminiscing party was held June 30 and July 1 at the band shell in the park. One of the former Gary railroad buildings, donated by Mrs. Vernon Blaine, was moved to the Historical Park from her farm.